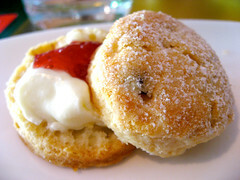 The black currant scone with vanilla crème fraîche and house-made jam. Since the Art Gallery of Ontario re-opened about a year ago, I hadn’t seen anything more than its curvy glass exterior. And while I still haven’t been through their redesigned galleries, I did recently manage to hit up their not-a-cafeteria restaurant, Frank. Divided into three sections, accommodating single diners as well as large groups, this is a lovely and cohesive space. The warm sun streaming through didn’t hurt either. Main seating area. Lots of light wood and glass. And a wall of wine. We started out the morning with scones and the basket of house-baked breakfast pastries. I’m not sure about the rest in the basket, but aside from the scones, the croissant I tried wasn’t really something I wanted to finish. A little gummy and not nearly flaky enough. 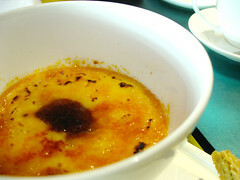 Now, the black currant option was quite tasty, especially after adding a dollop of cream and a swipe of jam. The scone itself was just moist and had a decent chew. Sadly, I didn’t get to try the cheddar option, as I had to share. Le sigh. Salt in a shell. Cute. 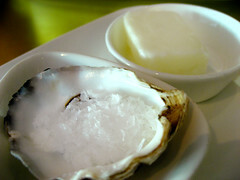 On the table was some Maldon sea salt and goat butter. While I appreciate the fact that they even offer the latter, I didn’t like the goat butter. Too goaty and it overpowered the bread. Interesting though. Now, while I have a ton of photos of great-looking dishes, I can only speak about two, since I had to be polite and not swipe bites from other people’s plates. The roasted glazed whey-fed pork belly was really quite nice. 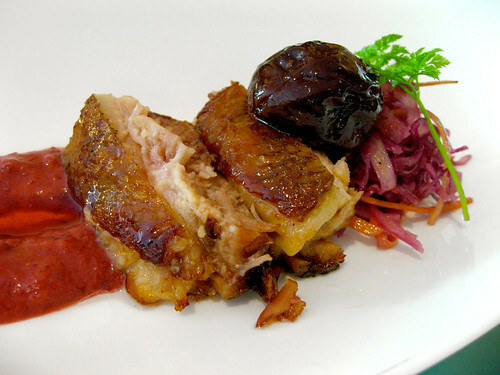 Came with house-made plum-cardamom mustard, red cabbage slaw & brandied niagara prune plums. The pork itself was tasty and tender. Had some reservations about the mustard, but in the end, it paired well with the pork and I quite enjoyed it. Now, this was what I ordered and I didn’t regret a single bite, despite how full I was in the end. 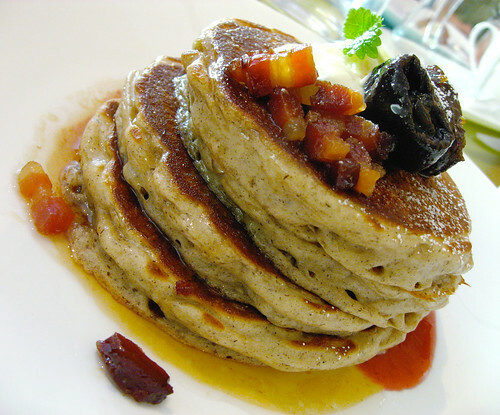 A five-stack of buckwheat pancakes with maple-braised lardons, maple-poached prunes, and a plum coulis. These fluffy pancakes had just the right amount of chew to them – not heavy and gummy like some can be. The lardons were a nice salty contrast to the sweetness of the maple syrup. I would definitely order this again. Shepherd's Pie with braised Ontario lamb stew topped with a gratin of rosemary-chèvre mashed potatoes served with a side salad & pickled baby carrots. 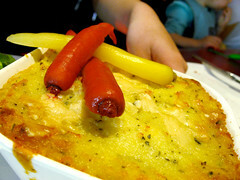 A filling dish. 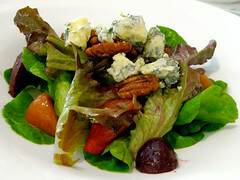 Beet Salad with candied pecans, cièl de charlevoix blue cheese, red & green oak leaf lettuces. More leaf than beet, which was a dissapointment. 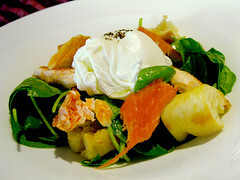 Organic poached egg with smoked arctic char on a salad of mixed baby spinach greens & garlic fried croutons dressed with Dijon vinaigrette. 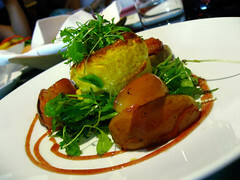 Roasted buttercup squash and cheddar soufflé with carmelized courtland apples, apple cider reduction & micro seedlings. 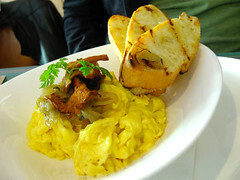 Brown butter scrambled eggs with sautéed chanterelle mushrooms, sage & onions. Served with toasted baguette. Rice pudding brûlée with concord grape compote and spelt flour short bread. Trio of ice-creams Peanut butter (I hear that was good), a brown-sugar sour cream, and I forget what the red berry type one was. Chocolate-espresso pumpernickel bread, dried sour cherries, brandied sour cherries, and vanilla whipped cream. 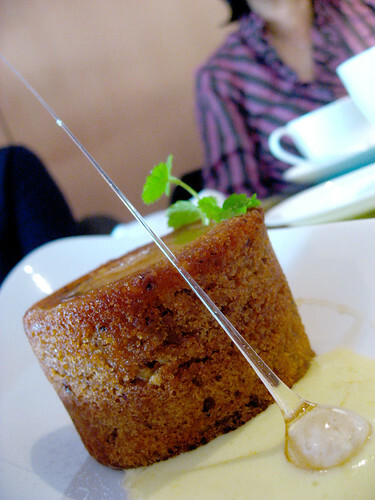 Pear-hazelnut ginger cake in a honey-wine sabayon sauce. We really were enamoured with the sugar art. Now, with a large group comes a lot of dishes. Which is great for me, since I get to shoot more dishes than usual. The down side is that I don’t get to taste everything. Overall, I found the dishes were fairly good and that they were very nicely plated. 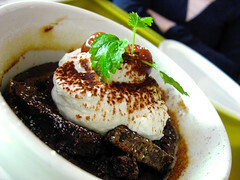 Desserts were equally lovely, but on the whole, the mains fared better on the taste scale. Visit Frank with the family some weekend – the large accommodating space and an interesting menu make it a good spot for groups of all kinds. 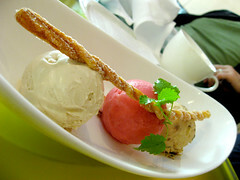 if i recall correctly, the brownish ice cream was date/prune and the pink was crabapple. This was fun to be a part of. Very nice place. Would drop by again. Thanks for the review! 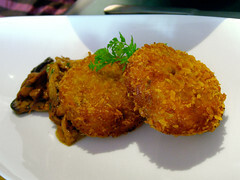 Food (and photos) look great! the chance. I’ll have to try it out over the Christmas holidays! FC > Thanks for the correction!! I would go back too. Ryan > Thanks Ryan! It’s a really nice space and food is solid-to-pretty-good.